As children, Mom told us to “join the clean plate club” in order to avoid wasting food. Considering today’s generous portions that may not be such a good idea unless you’re in a backcountry environment where eating all the food on your plate is one of the most basic steps toward reducing food waste and human impact on the environment. Creative cooking over a stove is one of the joys of outdoor adventure. What to do with the leftovers, food waste and dirty dishes – the gray water – is a different matter. Dirty dishes are often unavoidable so when it’s time for KP, Leave No Trace recommends using methods that are appropriate for the environment you’re visiting in order to protect water sources and minimize the chance of providing food rewards to local wildlife that may alter their natural habits. 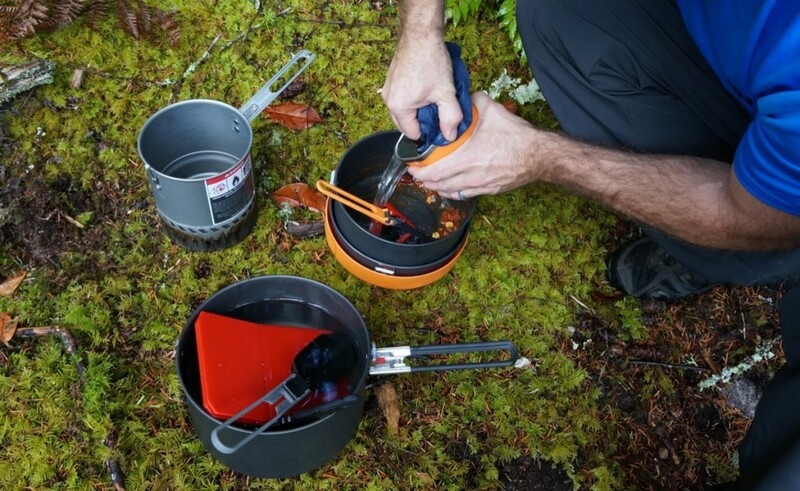 Tips for cleaning dishes in the backcountry: You’re in the backcountry. You’ve eaten a meal. There’s a dirty bowl, a dirty spoon, and a dirty pot. Now what do you do? 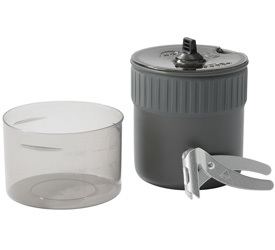 Scrape it and pack it: Scrape any remaining food from all dishes into the trash that you’ll be packing out. You can almost get a bowl entirely clean with a small spatula, a tool like the MSR Alpine Dish Brush, or a microfiber towel. Use hot water: Heat water over a stove. (Bringing it to a boil is the safest way to avoid waterborne threats.) Take the water and dishes at least 200 feet from the source and away from water sources – approximately 70 adult paces. With a scrub pad or something similar, use the hot water to clean the dishes. If possible, collect the washwater, also known as gray water, into a single pot. Strain the gray water into a single pot using mesh, a bandana or a plastic bag with straining holes cut in it to capture food residue. Dump the food residue into the trash that you’re planning to pack out. Get rid of the gray water by digging a sump hole (6-8” deep hole) and straining the water into the hole (recommended especially in bear country), or broadcast it around in multiple directions to ensure the liquid is spread over a wide area. Location is key. Keep gray water 200’ away from water sources like streams, springs and lakes. Ridgelines and hills are good. Consider ditching the soap: It’s a judgment call but soap may not always be necessary for short, small group outings according to Leave No Trace. When soap is necessary for larger groups or germy partners, choose biodegradable options but consider that even seemingly environmentally friendly soaps take a long time to completely dissipate. Avoid soaps with phosphates, which can be damaging. Most importantly, prevent soap from getting into water sources. The bacteria that break down soap exist primarily in soil, not water. Soap that enters the backcountry’s waterways can remain for years. And if you use soap, use the minimum amount needed to get the job done. 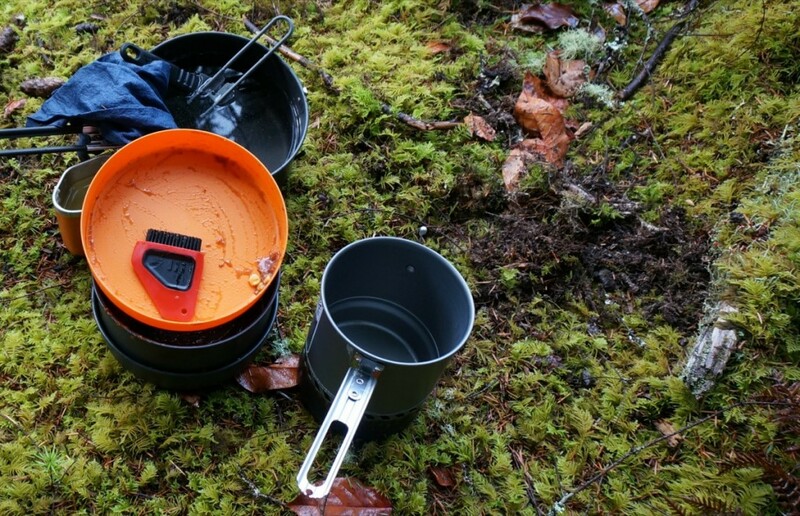 “It seems like common sense but minimum impact dishwashing in the backcountry stymies a lot of new and experienced outdoor enthusiasts,” Lawhon said. “The practices we suggest are general so we always recommend checking local land management procedures and regulations to ensure that whatever methods you use are tailored to the environment you’re in, whether it’s in the backcountry or an established campground in the frontcountry.” To learn more about ways to improve your personal impact on the places you frequent, visit LNT.org.